In political analysis it is important to not relevant precedents & apt comparisons. But it is also important to note the absence of relevant precedents or comparisons. 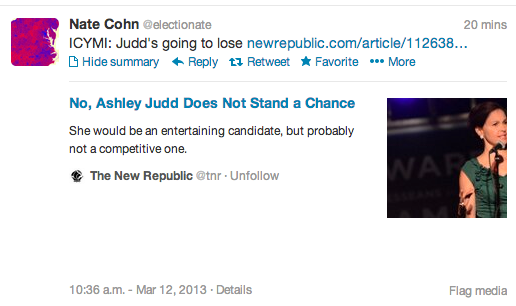 Unless someone can come up with similar search results for “Name of Candidate” + magazine + cover, I prefer to operate under assumption that an Ashley Judd candidacy would have no precedents or sound comparisons. As a result, I intend to be humble in my predictions.